MI vs RR Match Summary: What could have been an easy victory, Rajasthan made a mess of a run-chase only to early two points in the end. Nonetheless, the Royals earned a win they desperately needed on Saturday. Chasing a 187-run total, Jos Buttler hogged all the limelight against Mumbai Indians at Wankhede. 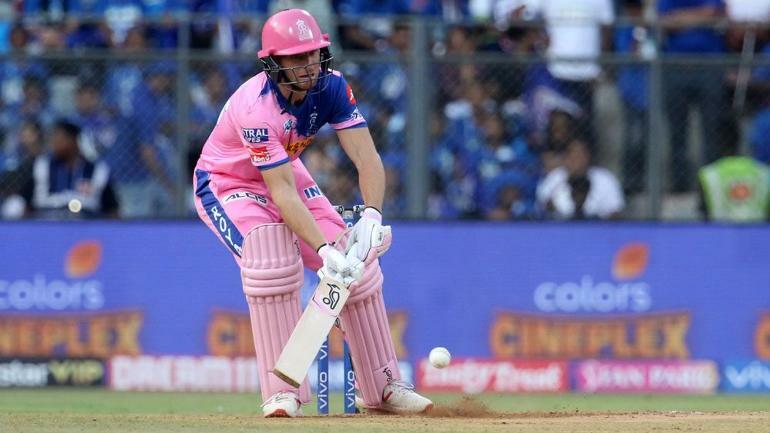 The English wicket-keeper batsman went hammer and tongs against Mumbai Indians, amassing as many 81 runs off 43 deliveries. In pursuit of a mammoth 187-run total, Ajinkya Rahane and Jos Buttler were off to a flier. For the first time in the tournament, Rahane was the aggressor between the both who smashed seven boundaries in his stay at the crease, while Buttler played as a second fiddle till the power-play overs. Once Rahane departed, Buttler switched into fifth gear, as he along with Sanju Samson collected 87 runs in the next seven overs. The English wicket-keeper batsman hammered 28 runs off Ajzarri Joseph in the thirteenth over, including two sixes and four fours. Rajasthan Royals were cruising into the chase till that time, however, Rahul Chahar then accounted for Buttler’s wicket in the next over, which saw Mumbai tightening the screws from there onwards. RR were needed only 20 in the last four overs, with eight wickets still in hand. Jasprit Bumrah and Krunal Pandya bowled spectacular 17the and 18th over, giving away just six runs and getting three wickets in the process. 14 runs were needed in the last two overs. Bumrah took the crucial wicket of Steven Smith and gave away eight runs in the penultimate over. However, Shreyas Gopal held his nerves in the final over and took his team home at the end, earning a swashbuckling four off Hardik Pandya’ third ball of the over with three balls left to be played at the end. After being put into bat, Mumbai Indians notched up 187 at the end of 20 overs in the first innings. Rohit Sharma and wicket-keeper Quinton De Kock gave their side a blistering start in the power play overs. The duo added 96 runs for the opening wicket in as many as eleven overs before Jofra Archer accounted for Rohit Sharma’s wicket in the eleventh over. The Royals, however, did pull things back in the middle period, having given only 29 runs in the next four overs. Shreyas Gopal was the pick of the bowlers for Royals who gave away just 21 runs in his quota of four overs. The leg-spinner didn’t get any wicket however, made sure he keep building pressure from one end by not leaking too many runs. Middle order wasn’t as effective for Mumbai as the likes of Kieron Pollard, Suryakumar Yadav, and Ishan Kishan went cheaply for 6, 16, and 5 respectively. The middle-order collapse led many of us to believe that Mumbai might end up on a below-par total, however, Hardik Pandya gave the team the required final impetus to stretch the total to 187 at the end of 20 overs. The all-rounder clobbered three sixes and one four in his unbeaten knock of 28 off 11 deliveries.